The Thyroid is a butterfly shaped gland in the lower, front area of the neck that creates hormones. Many people develop nodules or "lumps” in the thyroid gland. About 5% of thyroid nodules can be a thyroid cancer. Most thyroid cancers are felt to have a very good prognosis. 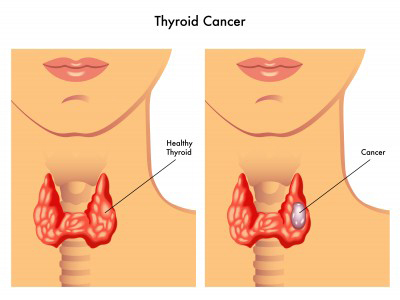 There are four main types of thyroid cancer: papillary thyroid carcinoma, follicular thyroid carcinoma, medullary thyroid carcinoma, and anaplastic carcinoma. Other malignancies of the thyroid gland include lymphoma or cancers that started in other areas and have spread through the bloodstream to the thyroid (metastasized). Thyroid cancers are typically found on exam by a medical provider as a lump in the thyroid area or as an enlarged lymph node. Some are found coincidentally with other studies like a CT scan of the spine or chest or study of the carotid artery flow. Initial investigation includes blood tests to see how well the thyroid is functioning and an ultrasound to assess the lump. The ultrasound can usually not tell the type of lump or if it is a cancer or not. Depending on the size and other characteristics seen on the scan, a fine needle aspiration biopsy (FNA) guided by the ultrasound may be warranted to determine if it is a cancer and which type. Sometimes other studies like MRI or CT scan are needed to assess the extent of the tumor. By far the most common is papillary thyroid carcinoma, making up about 80% of thyroid cancers. Fortunately, it usually has a slow growth rate and is the one with which we have the best success. It is more common in women, and its peak age of presentation is about 40 years old. It typically presents as a lump in the thyroid area or an enlarged lymph node in the neck. The best treatment is surgery. The extent of surgery depends on several factors but can be total thyroidectomy (the whole gland is removed), near total thyroidectomy, hemithyroidectomy (the half containing the cancer is removed), and sometimes the removal of surrounding lymph nodes that may be affected. Papillary thyroid carcinoma can spread quickly to the lymph nodes, but interestingly, early regional spread like this may not affect the prognosis. After surgery, depending on several factors (gender, size of the tumor, and tumor behavior), radioactive iodine treatment may be recommended. Six to eight weeks after surgery, a small dose of radioactive iodine is given to see how much thyroid is left after surgery and see if there is evidence of cancer spread. A treatment dose is then given based on the findings. The residual thyroid and thyroid cancer then soaks up the iodine, and the radiation kills the cells. This can only be done after a total or near total thyroidectomy. After treatment, patients are put on thyroid hormone replacement at slightly higher than normal doses. This will hopefully suppress any thyroid cancer from growing. Surveillance for any cancer recurrence includes intermittent neck ultrasounds, blood tests, and sometimes radioactive iodine scans. As mentioned above, the prognosis of those with papillary thyroid carcinoma is very good with greater than 90% cure rate. Because of its slow growth rate, many people with known persistent or recurrent disease will live long and normal lives. The next most common thyroid cancer is follicular thyroid carcinoma. It presents the same way as a papillary cancer. Fine needle aspiration biopsy will show a "follicular lesion of undetermined significance.” The diagnosis of benign vs. cancer depends on the microscopic architecture of the tumor. This cannot be seen on the needle biopsy. Most of these will then need to be removed and the pathologist will look for tumor cells invading outside of the tumor or into blood vessels of the tumor. If these are found, then the diagnosis of follicular thyroid carcinoma is given. If minimal invasion is seen, it may be possible to only observe after the hemithyroidectomy. If more extensive invasion is noted, then a completion thyroidectomy to remove the rest of the gland is needed, followed by radioactive iodine treatments. Follow-up and surveillance is the same as with papillary thyroid carcinoma. The prognosis of follicular cancers is worse than for papillary with about an 80-85% survival rate at 10 years. It can spread more readily to distant sites in the body, like the lungs. Hürthle cell carcinoma makes up about 10% of follicular cancer and has a worse prognosis. Medullary carcinoma is derived from cells in the thyroid that secrete calcitonin, a hormone that helps the body maintain calcium levels. They make up less than 5% of thyroid cancers. They are more aggressive and readily spread to lymph nodes in the neck and to other sites. They present as other thyroid tumors do. They can be diagnosed with FNA of a thyroid lump of an enlarged lymph node or after removal of the thyroid. Many will require removal of surrounding lymph nodes. Blood tests can reveal high levels of calcitonin in the blood. This can help diagnose a medullary thyroid carcinoma or help determine if it is still present in the body or has come back. Twenty percent of medullary cancer may be genetic, having a mutation in the DNA. If one is found then family members may need testing and maybe even thyroidectomy to prevent the cancer from developing. Since this cancer is not from the normal thyroid cells, they do not take up iodine, so radioactive iodine therapy is not indicated. Anaplastic thyroid carcinoma is one of the most aggressive cancers in humans. Luckily, it is not common, less than 2% of thyroid cancer. It usually presents with a rapidly growing neck mass, pain, hoarse voice, enlarging neck lymph nodes, difficulty swallowing, and difficulty breathing. FNA or open biopsy can be done. Treatment can include surgery if the tumor is small or has not invaded the surrounding structures. If the cancer has invaded neighboring structures (trachea, esophagus, larynx, carotid arteries), then surgery may not be an option. If the trachea (windpipe) is involved, then it is common for the patient to need a tracheostomy tube placed for a safe airway. Treatment is usually with external beam radiation (as opposed to the radioactive iodine used with papillary and follicular thyroid cancers) and various types of chemotherapy. Even with aggressive management the overall survival is only 10-15%.